Replacement of your HVAC. Consider the age of your heating system before you do anything. Usually, systems that are more than 10 years old are only 50 to 60% efficient. 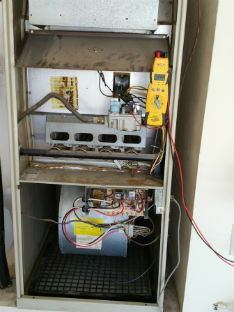 If your system is old, consider replacing the whole HVAC system. Clean or replace air filters. Dirty HVAC filters restrict airflow. This reduces entire efficiency of the HVAC system. Cleaning the filters should be done monthly. Adjust the supply register. Cold air falls and hot air rises. When the weather cools, proper adjustment will facilitate the heating of your commercial building in a more efficient way. Your HVAC system specialist can guide you. Calibrate the thermostat. Correct calibration greatly increases the efficiency of your heating. Invest in a programmable thermostat. A programmable thermostat enables you to manage the cooling and heating of your building and can reduce heating costs anywhere from 20 to 75%. Get a professional HVAC inspection. A professional contractor should inspect your HVAC system at least twice a year. Prescott Air Conditioning suggests HVAC inspections before the winter season. No matter what brand or model of furnace you have in your Prescott home or office building, Prescott Air Conditioning has the expertise and knowledge to inspect and service your HVAC system. To ensure increased reliability and durability of your unit with regular maintenance, call Prescott Air Conditioning at 928-308-1254 to schedule an appointment.